Hydraulic ripper is a physical crushing equipment that its set mechanical hydraulic mechanics, and digital signals, digital surveillance as a whole. The knife tooth of ripper can be have a impact on object (target detritus) to broke .under the action of the exciter. 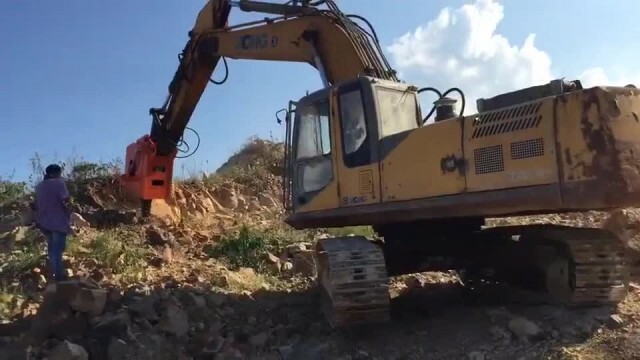 The excavator hydraulic energy can be passed to the hydraulic motor to produces vibration of eccentric gear in the rotation,And then generate centrifugal force F,The vertical component F sin wt is the periodic change of disturbing force,Make the shaft of the radial forced vibration stress,called exciting force. Then,By the vibration exciter cabinet will be passed to the bucket teeth crushing operations. The Crushing principle is different from the piston hammer,has more obvious in the field of use. Hydraulic ripper is a kind of high efficiency and energy saving knapper. It works without noise pollution and has no impact on excavator hydraulic system. Beiyi Machinery is a high tech enterprises with high frequency hydraulic ripper production capacity. The products we research and developed is strength, high efficiency, strong and durable. From the very beginning this equipment is only promoted for mining and other mining environment but due to its low maintenance frequency, low loss, low noise and high efficiency of energy conservation and environmental protection advantages, it gradually began to enter into the urbanization construction field. In some developed areas in eastern Europe have gradually started to replace broken role in urban construction.